We love bubbles in our house. Nothing beats some good old fashioned FUN with BUBBLES! We love to mix up a great big batch of our Homemade Bubble Recipe and then simply play – whether it is making GIANT Bubbles or ordinary bubbles, the kids ALWAYS love a good bubble playing session (in fact we have a fantastic set of Bubble Activities for you to browse). But let’s not forget the little ones among us. 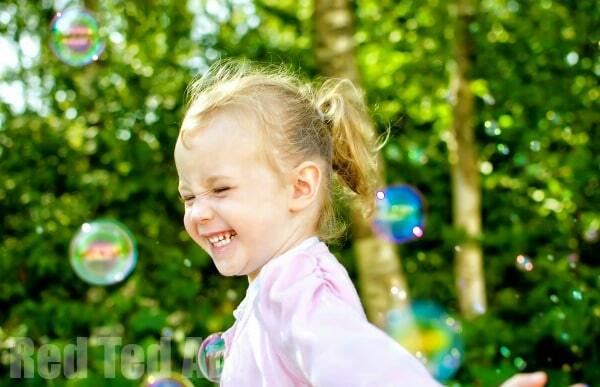 Bubble and playing with bubbles is just such a captivating activity for toddlers!! 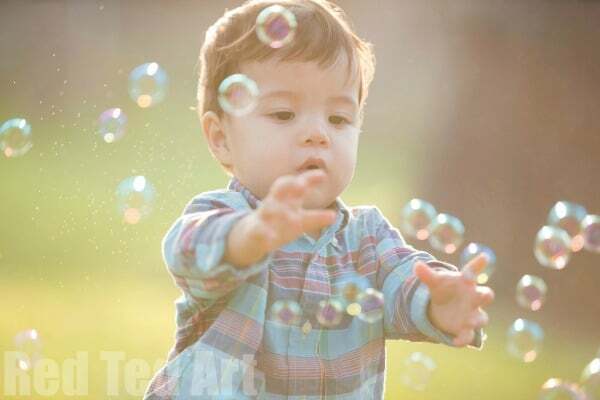 Though infants and toddlers will simply JUST ENJOY playing with bubbles, chasing them, catching bubbles and bursting bubbles, it is a great opportunity to introduce some simple learning bubble activities for toddlers. It is so easy to turn a wonderful bubble blowing afternoon into an afternoon of basic learning skills too. And your toddler won’t even realise! 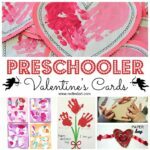 You toddler or even preschooler will just love the additional attention are giving them plus of course PLAYING with all the bubbles. 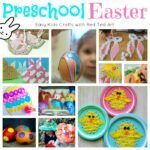 I hope you like our bubble themed ideas for infants and toddlers! One word of warning: bubbles + toddlers = bags of fun and giggles. BUT, there will be a lot of SPILLAGE. It is just the way of the world. So when you doing bubble activities with toddlers, DO use homemade easy bubble solutions, because you can literally whip up a BIG BATCH, decant small amounts at a time… and when something accidently gets spilled or knocked, don’t fret… use it as an opportunity to clean the floor and get out some more! After all.. playing with bubbles literally is good CLEAN fun! So let’s have some fun with bubbles! The bubble recipe we use, is also the one used by the Bubble Show at the Science Museum London.. how is THAT for endorsement. It is simple and fun. 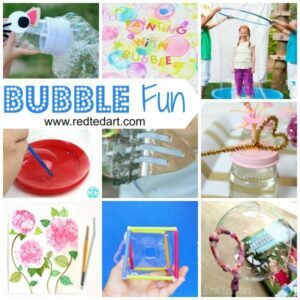 Many of the bubble activities suggested below can be played in the garden, the house or even in the bath. Just watch for slippery floors if doing this indoors). 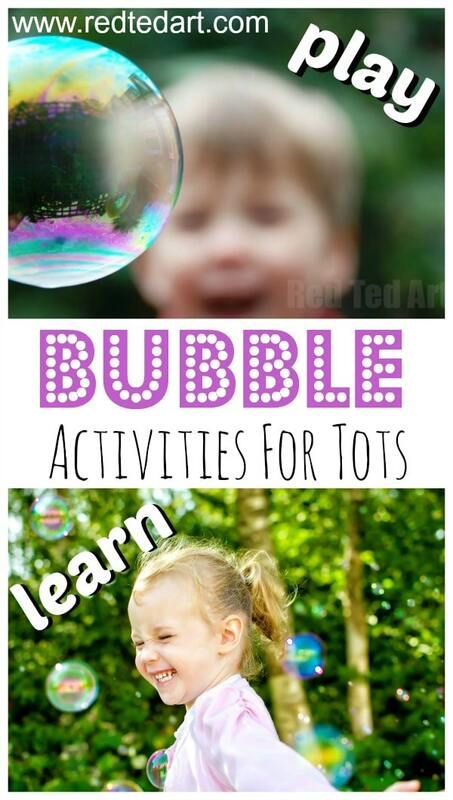 So.. are you ready for our easy educational bubble activities for toddlers? Yes of course. 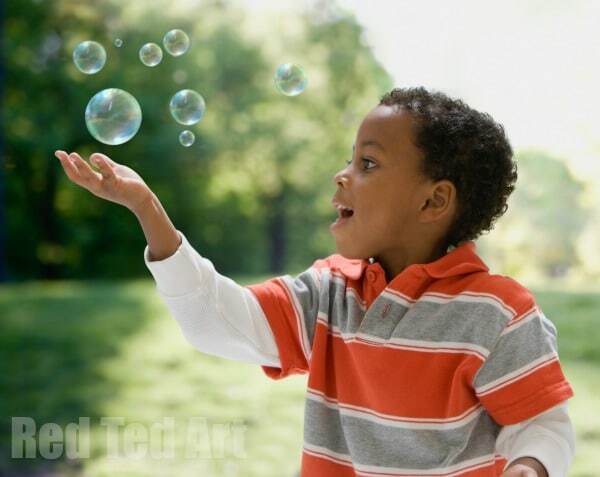 This is what all toddlers and children naturally do when they see bubbles and engage in bubble play: CHASE them!!!! It is a really fun way to get the kids moving and burn off a little energy. For infants and toddlers however, it is also a great way to develop their gross motor skills. Afterall, they need to move and run into a certain direction, as well as jump and try and catch the bubbles. A natural hand eye co-ordination exercise.. can they CATCH the bubble? Needless to say, most children can play this game for HOURS……. if you do end up playing this for a while, just watch out for slippy floors. It can get wet and soapy after a while. 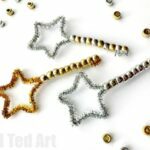 Ready for some more bubble themed ideas for infants and toddlers? 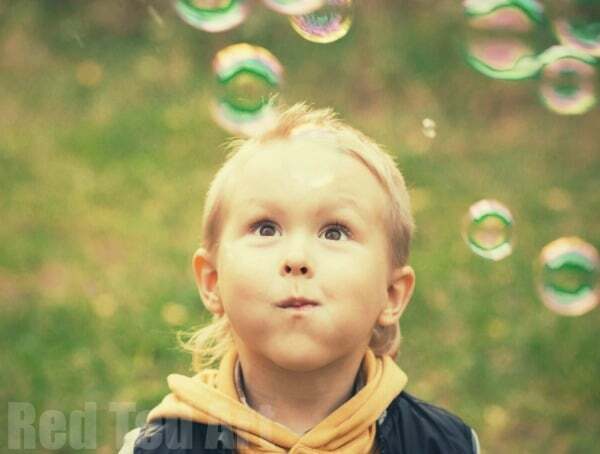 If you need the toddler bubble activity to calm down a little, without taking the fun away… see if you can persuade your toddler and preschooler to CATCH the bubble.. but not just catch it.. catch it without bursting it. A step up from the previous game, this bubble activity for toddlers, really forces them to slow down, concentrate and focus on what they are doing. It is also a great fine motor skills as they gently try to catch the bubble. To enhance the fine motor skills and introduce the “pinching motion”, slowly pinch your bubble and see how far you can squeeze it without bursting! If you are looking for some literacy activities, here is a simple B is for Bubble printable. A lot of toddler learning activities focus on words that help identify opposites. This is great for language development. We have 4 different sets of bubble activity “opposites” for you to explore. The 4th will require an introduction of another material – ie you will need more than just bubbles!! First begin with UP and DOWN. As with counting.. start off by describing what the bubble is doing to your toddler. “Look, can you see the bubble going UP?” and similarly as it comes back down again. Or if it drifts off… “Oooh now the bubble is so FAR away?” etc. 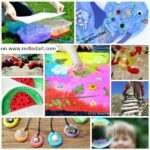 Bubble play for toddlers is also perfect for BIG and SMALL destinctions.. afterall bybbles come in so many sizes. You can keep it simple at the beginning with “big” and “smaller” and later ask “which is BIGGER, which is MEDIUM, which is small”. This can be a challenge for yourself too – are you ABLE to blow a big or a small bubble on demand? Again, bubble activities for toddlers are PERFECT for the many and few comparisons and introducing these language concepts. Kids of course ADORE MANY bubbles, but can they spot the difference and use the words correctly. You can also use synonyms. 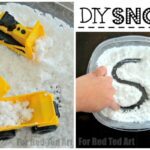 Don’t just focus on the basic words (especially if you find your toddler has mastered them already), how many different words can you find for the word “MANY”? Lots, tons, plenty etc. Similarly work on the word “FEW”. Also use “not many” to indicate opposites and the relationships between words. You can introduce maths skills at this point too. Count the bubbles – say it is 8 and say “look, 8 bubbles, that is so many bubbles, don’t you think” or “only two bubble, oh that is not many, so few bubbles, let’s make more!”. Have you ever noticed how a bubble that splats on the floor often leaves a circle behind? Yes? Perfect.. No? go and take a look it is really cool. 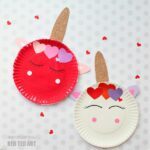 And this bubble play activity is great for pointing out the difference between 2D and 3D shapes – the flat 2D shape of the burst bubble making a neat circle. The 3d shape of the bubble sphere. Maybe use the opportunity to ask your toddler to find other circles (plates, sellotape) and spheres in the house (tennis ball, apple). Ok now it is time for some bubble games. The simplest of all bubble games is of course to chase and catch…. but who can keep the bubble UP the longest. You can blow, fan, use any method you like, just don’t let that bubble fall down and pop! And finally.. when you have had a good old bubble blowing session and need a little break.. tip some of the bubble solution into a container with water, hand over a whisk, great some wonderful foam.. and give your toddler a fabulous sensory experience as they play with the bubble foam. 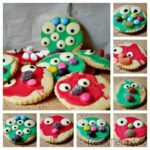 You can add food coloring for extra contrasts and sensory experience too! 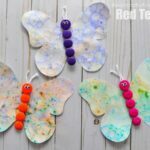 Here is a great post on “rainbow bubbles for preschoolers“, which can be added to the explorative bubble play at this point too! 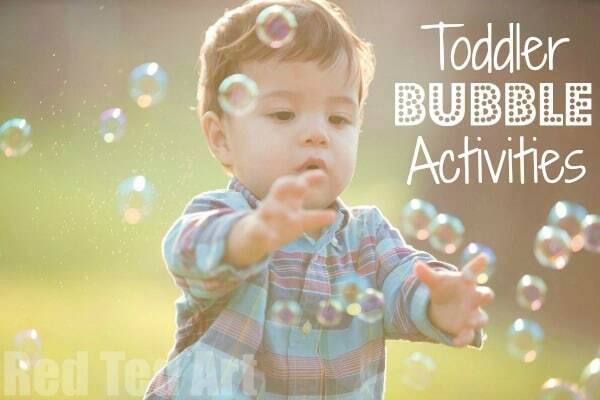 Hope you have lots of fun with these Bubble Activities for Toddlers today! Remember to make your own Bubble Solution and of you go!